Strawberry Pots for the small space gardener. Planter gardening is the perfect way to grow your own strawberry crop. How to choose a strawberry planter for patio gardening. Keep your strawberry planter close to a window or doorway so that the succulent strawberry smell can sift through the house on a summer breeze. The best pots for growing strawberries are functional, attractive and hold enough soil that a daily (or every other day) watering is all that's required. Made from plastics, glazed or unglazed clay and even woven plastic planting bags. 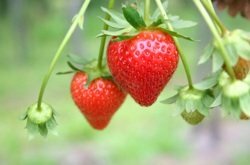 Anything that holds soil could potentially be used for growing strawberry plants. Strawberry pots are unique in that they have planting pockets down the sides of a tall container to better utilize the soil in the planter. Taking advantage of vertical space also means that a lot of berry can be grown in very little floor space. Glazed clay pots are great containers for growing strawberries, especially when they are cast with the planting pockets that make a strawberry planter so functional. If they have a downside it's their weight but they're durable and hold moisture well. Although unglazed clay pots look fantastic, especially when they earn their patina of moss, they allow the moisture to evaporate through the porous clay and it can be hard to keep your plants adequately watered. If you have your heart set on an unglazed Clay Pot choose larger pots and line them with plastic before filling to make it easier to keep your strawberry plants well hydrated. 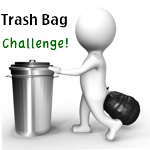 Plastic is lightweight and holds moisture relatively well. Good quality plastic planters can last for 10 years or more and are ideally crafted with little pockets, perfect for taming a small strawberry patch. Whichever type you choose, fill with good quality soil (mix in some of your home compost if you're lucky enough to have any) and add a plant to each pocket and a couple at the top (if design allows). Water thoroughly and you'll be picking dewy strawberries in a little over a month. Roomy planting pockets allow each plant enough leg room to develop a sturdy root structure, a necessity for healthy, productive plants. The planter consists of 3 stackable layers each of which has 3 individual planting cups. Stacked on top of each other the planter has room for 9 plants and takes up not much more floor space than a pair of men's gum boots. When not in use the 3 sections nest inside one another to use a minimum of storage area. The 30 Quart size holds twice the soil, doubling the amount of plants it'll hold and increasing water holding capacity. In just over a 14 square (14.2) inch footprint, this planter can support a family sized strawberry garden. A less spendy solution is a planting bag. This Strawberry Planter Bag holds 35 quarts (8 gallons) of growing medium and has heavy duty straps for moving the planter when it's full. Standing 18 inches high with a diameter of 14 inches, this substantial grow bag has 8 planting pockets and a roomy open top area to provide plenty of area for a complete strawberry garden. Planting bags are a little less permanent than planters but they make up for their temporary nature by being super lightweight, affordable and fitting in odd shaped spaces or inside a more permanent container. Because strawberry pots are an all-sided planter, turning the pot periodically gives every plant some time in the sun, also your plants may benefit from being moved into (or out of) the sun as seasonal changes occur. Once you actually add the potting soil the planter will be very heavy. Placing the pot on a plant caddy before you fill it makes it easy to move your strawberry garden whenever you want to. Visitors to our Strawberry Pots page may also be interested in the following pages.